Engineering calculation software. Easy-to-use calculation software for Windows. Extensive menu useful for day-to-day operations. 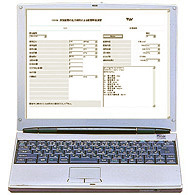 • Extensive menu of calculations useful in day-to-day operations. Does various types of engineering calculations required for steam plant piping design. A variety of engineering calculations are possible for steam, condensate recovery, liquids, air and gas. Uses an interactive screen input method for easy operation. Comprehensive instructions guide the user in making entries. Units used for entries can be selected to suit the user's preference. Units used in calculation results can be altered to suit the user's preference. Menus for steam tables (saturation, superheating) and unit conversion, etc. also included. Selection, etc. of equipment and instrumentation required in a steam plant.